Melissa Wright and her brother Matt. Melissa fiercely protected her younger brothers, and loved her family more than anything. No one lives the perfect life; nor can anyone go back in time to change things. But a powerful legacy can shine brightly, overshadowing our shortcomings, warming the hearts of those we’ve left behind and guiding others on a better path. Melissa Wright left the world too young, at the age of 28, from Cervical Cancer. She would be the first to admit that she wished she had done things differently. However, her family and friends will forever carry her exuberant love in their hearts. And her mother and brothers will do everything possible to grant her wish to spread awareness of Cervical Cancer and the importance of education. But Melissa’s life was to take a tragic turn. Long-term symptoms finally drove her to the doctor’s for an exam, which revealed what turned out to be Cervical Cancer. Melissa was absolutely determined to beat the cancer. She moved home and underwent treatments. She was declared ‘in remission’ and threw a huge celebration. Then, when health problems brought her back to the clinic for exams, it became clear the cancer had returned and spread. Melissa’s immediate family and extended family lovingly took on the role of caregivers, but couldn’t do it alone. 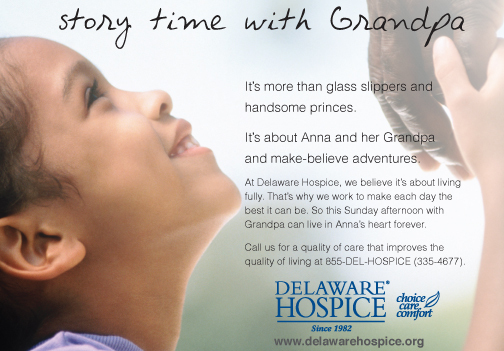 A call was made to Delaware Hospice, who came in to help manage symptoms and to support the caregivers. Greeting guests at “Mellie’s Legacy Banquet”: Joyce Bensinger, Association Director of Development, Carl Wright, Ginny Carr, Matthew Wright, and John Ward, Chair of Delaware Hospice Development Committee. Next Story → Don’t Let That Urge To Go Rule Your Life.